so my question to you good people, I know what hindugrass is... but what i am asking is what is its botanical name or other names the herb has. when hindu grass oil or such is made, what is it made with? Re: what is hindu grass? That info is in Cat's book Hoodoo Herb and Root Magic - you can order it through LM. Actually Hindu Grass is not listed as an herb in the book; it's probably just the name of the oil. It contains lemon grass. The oil Hindu Grass is i the same family as Van Van Oil but it doesn't contain all of the things Van Van does. It used to be a cheaper version of Van Van. Today people use it for the same things Van Van is used for; it's usually just a matter of personal taste, if you grew up with Hindu Grass oil instead of Van Van you still want that Hindu Grass. On the other hand I know one very good root worker that uses Hindu Grass oil instead of Van Van one because one of her family members is allergic to one of the constituents of Van Van. Then again I may have confused Hindu Grass Oil for Henry's Grass Oil, so yea, I could be completely off base, lol. So not really a plant so to speak but the name of an oil that used a few,with vervain and lemon grass being tops? Hi there, I ordered some Hindu Grass oil recently to clear out some past issues. I am wondering if anyone would like to share some insight with me about this oil. Also, I am not so sure about how i would use this oil. Do i wear it? What color candle do I use to dress with Hindu Grass oil and why? Oils can be used a million different ways. Read the above page to get started. Is there a reason that you bought the product if you didn't know how it was used? An old Indian story describes Romaharsana being killed by Balarama, Lord of the universe, with a single blade of grass. and then having to fight a demon. The above is a good story I have always related to being part Gypsy, who were also called the Romani people. I did not know that this product was available. is it synthetic or made from real East Indian grass? Yes, Hindu Grass Oil is made from a blend of essential oils from several species of East Indian grasses, and has lemon Grass leaves in it as well. jujugiggles wrote: Is there a reason that you bought the product if you didn't know how it was used? yes, the reason was that i was drawn to its use for clearing up old messes. thanks for askin'. It can be used for a lot of the same things as Van Van oil can, if thats any help. HailDiscordia wrote: It can be used for a lot of the same things as Van Van oil can, if thats any help. Thank you HailDiscordia, that does help a bunch! There is no Vervain in Hindu Grass Oil that i know of. It consists of a blend of Asian (hence "Hindu") grasses. Henry's Grass Oil is identical to Hindu Grass Oil -- and this is also a very old name, dating to the 1910s or 1920s. Henry's Grass Oil was made by the Humana Co., an East Coast manufacturer and nationwide supplier of hair goods, barber shop supplies, and hoodoo supplies to the African American market. Henry -- probably the proprietor's surname -- was in the titles of many products made by this company, which included products such as Henry's Face Cream, Henry's Pressing Oil, and so forth. My friend was in a tight situation, trapped living in conditions that she didn't see a way out of. I told her I'd burn a candle for her. 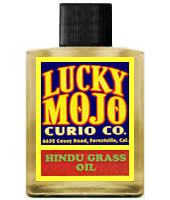 I applied Lucky Mojo's Hindu Grass oil to a yellow candle, said a prayer, and as soon as the candle was finished she found her way out of her predicament. I cannot recommend this stuff enough. Keyumdi: That is wonderful! I love reading about these successful results all the time. Sounds like you are on the right path! Great work. I have been successful when combining the same for the intended results you listed above. Glad to know others have seen the success as well. Mixing a bit of Hindu Grass Oil, Road Opener Oil, and Lord Ganesh Oil can pack one heck of a wallop. The page for Hindu Grass Oil comes up blank. I would like to know how to best use it to cut and clear from a previous marriage. We were divorced back in October of 2013. I was ok with it until he started dating someone who could be my twin, both in looks and in professional field. It's making me crazy. I have a bottle of Hindu Grass Oil and am hoping I can use it to cut and clear from this relationship. Thanks! I am moving your post to the appropriate subforum that can answer your questions. Can this oil clear my past Traumatic Experience? I want clear my bad past experience and move forward with my new experience. I want to get rid of emotional baggage in my life. Yes, it could. But, we also recommend seeking the help of a professional counselor first and foremost. use the products as an aide. I wrote emotional baggage backwards to get rid on a yellow candle. I rub down with this oil on the candle. Will it work? If you are looking for healing purposes towards yourself. I would use a blue candle for healing, and peace. Try to work towards a more positive afformation and write you intentions upward. Then dressing the oil upward on your candle. I hope this anwsered your question. To bring things in, you could use a yellow candle and anoint the Hindu Grass from bottom to top.